10:30 am Matt and I ventured out for breakfast. 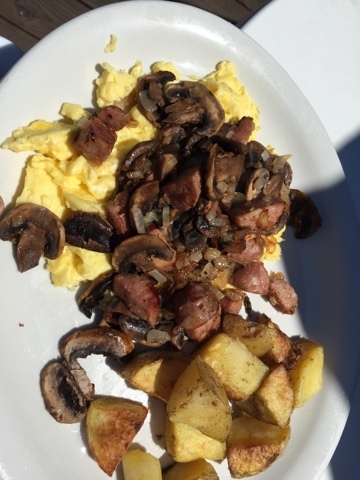 I got the egg scramble with mushrooms, onions and chicken apple sausage + potatoes. The chicken apple sausage tasted WAY sweet to me so I'm guessing there was sugar in it. 2:30pm To tide us over until dinner, Matt and I split a bowl of banana faux-oatmeal. 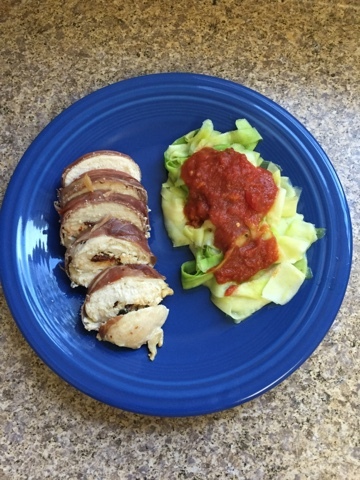 6:00pm Nom Nom Paleo's Chicken Prosciutto Involtini + zoodles and marinara. Today I was super close to breaking. I think I've just gotten to the point where I'm so close and I want to be done and is it even worth it to go the Whole30 days? Whole30 has been 10x harder on the weekends....and I'm still drinking wine! Matt and I love going out to eat and we both have major sweet tooths. He's been a good sport about staying in and eating lots of vegetables, but he did have a sample of cake at the store today and I wanted to slap him. Not fair.